Much is said about the rise of Chinese car culture at the expense of the once proud Chinese bicycle culture. Reports from the front lines in the Far East are generally negative, despite Katie's crooning about the 9 million bicycles in Beijing. The country does have problems that need immediate attention. No doubt about it. What we don't hear as often is that many cities are, in fact, addressing the problem. To their credit, they are acutely aware of the rapid onslaught of automobile traffic and are seeking solutions. A colleague of mine, Troels Andersen, is the Danish consultant on a project in Guangzhou, in Southern China, with The Institute for Transportation and Development Policy [ITDP]. Troels is one of Denmark's most experienced traffic consultants and him and I have been invited to speak at many of the same international conferences over the past couple of years. At the most recent one, we did what we usually do - drink beers and talk about bicycle planning for hours. With some football thrown in. We also collaborate on various projects with Copenhagenize Consulting and Troels' company. Troels told me about his work in Guangzhou and it sounded exciting. With the economic growth the status surrounding the car is rising, public transport continues to maintain its market share but the bicycle is regarded as old-fashioned. Fortunately, the current global trend of young, well-educated people choosing the bicycle again is also seen in China. Troels is involved in the ITDP project because of his experience but also because there is a wish to import Danish best practice regarding bicycle infrastructure. What follows is Troels' experiences in his own words. "Guangzhou, formally Canton, is a Southern Chinese city with a population greater than that of Denmark. About 6 million people. The climate is very warm and humid, which gives cyclists some challenges. There is massive economic activity in the area and new, large skyscrapers are constantly being built. An apartment complex with 5000 residents is the norm. ITDP has convinced the city to build the world's second-largest Bus Rapid Transport [BRT] system. A high-class bus network with dedicated lanes in the middle of the street and bus stations with digital arrival and departure boards and air-conditioning. In connection with the bus stations a bike share programme is implemented with 5000 bicycles - and 10,000 more on the way. The intention is increasing the coverage area with this combination of buses and bike share bicycles. 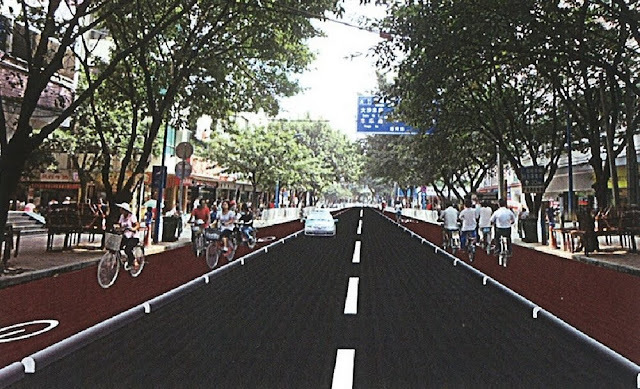 Existing bicycle infrastructure in Guangzhou. Some of the existing bicycle infrastructure actually beats anything we have in Denmark - 4-6 metre wide, one-way bike lanes protected from the traffic by trees and flowerbeds. The thousands of trees provide important shade and also act as a buffer against a good portion of tropical rain. Manned bicycle parking is everywhere - costing only €0.10 a day. The bike repair man on the side of the bike lane can also cut your hair if you like. Nevertheless, many roads have no bicycle facilities at all, despite massive traffic. Bicycle traffic counts for 10% of the total traffic. There are no facilities at intersections and waiting for the red light can sometimes take 5 minutes - a long time to wait anywhere, but especially in the tropical sun or torrential rain. In many places, people ride on the sidewalks or the wrong way down one-way bike lanes, which is an irritation for others and each other. Bicycle theft is another problem and one rarely parks outside of a manned parking station. Many people buy a folding bicycle to keep in their flat. Although living on the 6th floor with no elevator dosn't make this an attractive option. We chose to start with a neighbourhood where there was already a high level of bicycle traffic. The idea is simple: if the conditions here are improved to a level approaching the high Danish standard, there will most certainly be a registered increase in bicycle traffic. It is considerably easier to start with an existing bicycle culture than to build it up from scratch. Starting in such a neighbourhood would also make an expansion of the project to other neighbourhoods - and the entire city - a realistic option. - Bicycle counts and turning patterns at intersections. - Bicycle accidents are not registered, unfortunately, so we chose instead to make video registering of potential conflicts. - Bicycle parking facilities and parked bicycles. - Focus group interviews with citizens in the neighbourhood. - Interviews with cyclists on the streets. The first rough proposal was ready after a week. The point of departure is that if nothing is done, the traffic situation will worsen every day. The traffic is heavy but hour-long traffic jams like in Mexico City are not yet an everyday occurance. 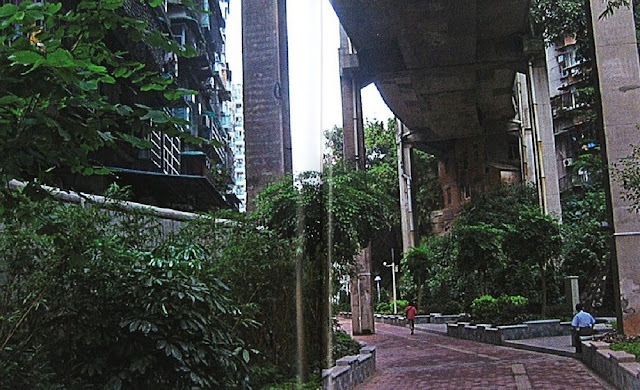 Guangzhou has recently invested million in transforming decaying areas into so-called Green Ways where pedestrians and cyclists can enjoy park corridors with sports facilities and playgrounds. Therefore a well-developed commuter network would be a fine supplement. The Danish recommendations are followed carefully - regarding separation, width of cycle tracks, busstops and intersection design (adapted to local traffic laws), behaviour and climate. The Danish approach to separation of bicycle lanes from motorised traffic is a key factor for both safety and perception of safety. In addition there is the possibility of integration of traffic calming measures and school route projects. In several intersections we can improve the length of the green lights for cyclists by 43% and reduce waiting times by 47%, without affecting the conditions for cars in any great way. ITDP's office is in the same building as the city's Traffic Dept. in order to nurture a close relationship and maximize influence. In China there is a very short route from decision-making to construction and, if bicycle projects gain political interest, a great deal can be built in just a few short months. If design mistakes are made in the first phase, they are usually corrected shortly afterwards. In addition to the project in Guangzhou, ITDP is starting similar projects in other Chinese cities and the potential is enormous. Denmark will be the model area for Chinese Bicycle Culture 2.0."